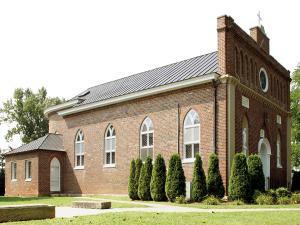 Sundays — Sat evening: 4 p.m.; Sun: 11 a.m., 6:30 p.m.
First Saturdays — 11 a.m.
Pioneer Catholics Thomas and Ann (Gough) Howard homesteaded a farm of nearly 370 acres along the Beech Fork River south of Bardstown. Their log house, which stands as a museum today, was constructed during the winter of 1795. For nearly fifteen years, they welcomed missionary priests to provide religious instruction and celebrate Mass in their home. When Bishop Benedict Joseph Flaget arrived in 1811, he received the property as a bequest and named it for Mr. Howard’s patron saint. St. Thomas’ first pastor was Father John Baptist David (1812-1819), who was later ordained a bishop, serving as Bishop Flaget’s auxiliary. St. Thomas Farm was the site of many historical institutions. It housed St. Thomas Seminary (1811-1869); it headquartered the Sisters of Charity of Nazareth for the first decade of their history; and it held Nazareth School from 1814. The brick church, modeled after St. Mary Chapel on Paca Street in Baltimore, Maryland, was completed in 1816, serving a dual role as parish church and seminary chapel. The newly restored St. Thomas Church is the center of the parish’s life. The Christian formation of persons has always been a vital mission on this historic property. The log house functioned first as a seminary, then at various times as a convent, orphanage, and rectory. From 1914 to 1931, it served as the parish elementary school. In 1957, the parish once again opened an elementary school, which continued to serve the formation of children until 1998. In that year St. Thomas Parish embraced the mission of lifelong formation and education, providing religious and spiritual formation opportunities for parishioners of all ages. With over 1,200 parishioners, St. Thomas continues today as a vibrant community of faith.